It’s officially June and I honestly don’t know how we got here so fast. Five months have never escaped my grasp so quickly. Are you feeling that way at all? As I think about where the time went, I’m trying harder to look forward and think about all the time left. We can’t control how fasts time goes, but we can control what we do with the time given. 1. It was a shorter week so I felt like I had a chance to relax over the weekend and then use Monday to get ready for the week. 2. It was just a good week. I’ve switched from going to fieldwork I need to for course credit to volunteering because I like the mission, I like the networking and it’s a good use of time to give back. This week we shifted gears from executing a conference to full-blown gala planning. I’m revisiting my roots of fundraising, which is nice because that’s a skill I have. However, I’m being pulled into more strategic planning and timeline initiatives for sponsorship conversations, which is slightly new. I had worked with individual donors, not organizations, but the principles are similar. There’s still one individual we’re speaking with on behalf of the organizations and companies we’re soliciting, but there’s a few more steps to close an ask. I’m working on examining community data and correlating socioeconomic status and school district with obesity rates and wellness programs and prevention plans. It sounds more complicated than it is. I’m looking through census data and state data to see what school districts have the ability to implement proper programming and what schools should we reach out to so we can lend a hand with some programs we’re designing. Not everyone has resources and our goal is to help those who need the extra assistance first. I love what I’m getting involved in. On the side, I’m also working on strategic marketing and health communication to engage with their target audiences. It’s making me think differently about how we talk with different populations and approach different health issues. It’s a good challenge and I feel like I’m considering multiple perspectives that weren’t being considered before. Not only is this good for this organization, but as I consider my own coaching business and how I talk to my clients. People need to be met where they are and then brought up. Outside of the work stuff, I was pretty pumped about my first go at donuts this week and how my lifts are feeling during the fifth week of programming. Here’s the recipe I used for the batter. The ONLY change I made was the substitution of almond milk + 1 teaspoon vinegar instead of buttermilk. I didn’t use their glaze, but instead made my own after looking at other recipes. 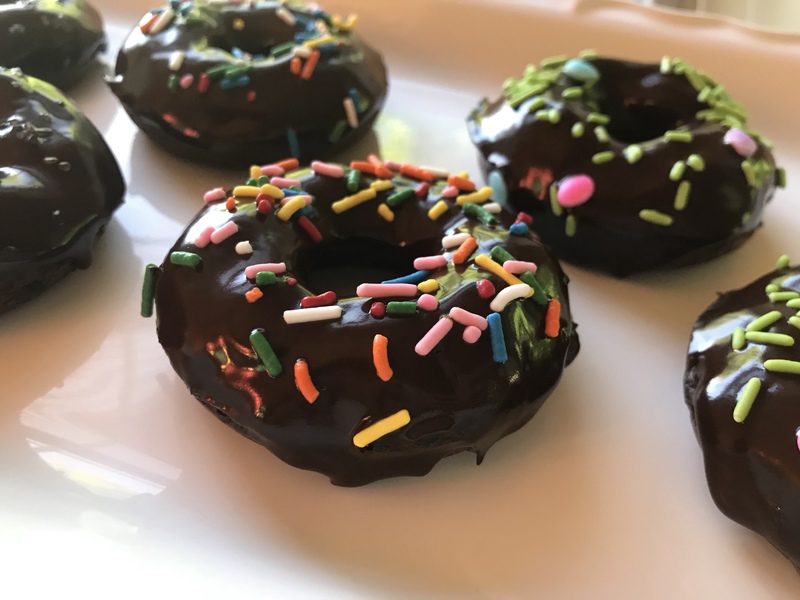 I decided to make donuts for National Donut Day because I didn’t want a standard chain donut and I couldn’t get out to Kane’s for my beloved turtle donut. I guess I’m a bit picky and I have a preference on taste. I’ve also been wanting to make my own for a while and this was as good of an excuse as any. For baking, I’d like to try a few other batter recipes before making modifications or trying to make my own flavors. Baking is a different monster in comparison to cooking – the chemistry is much more important, but I think it’ll be fun to try some new recipes and check off a few from my Pinterest boards. It’s weird having the time to plan to bake, but I could get used it that’s for sure. 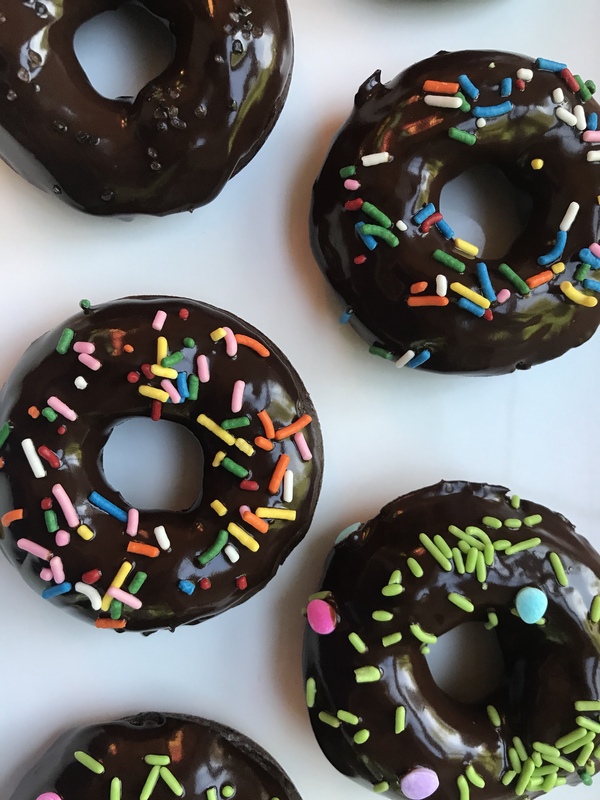 So this week donuts, next week – we’ll see. I finished the fifth week and started the sixth week of PH3 and my lifting feels good. Most days it feels right where it should be. 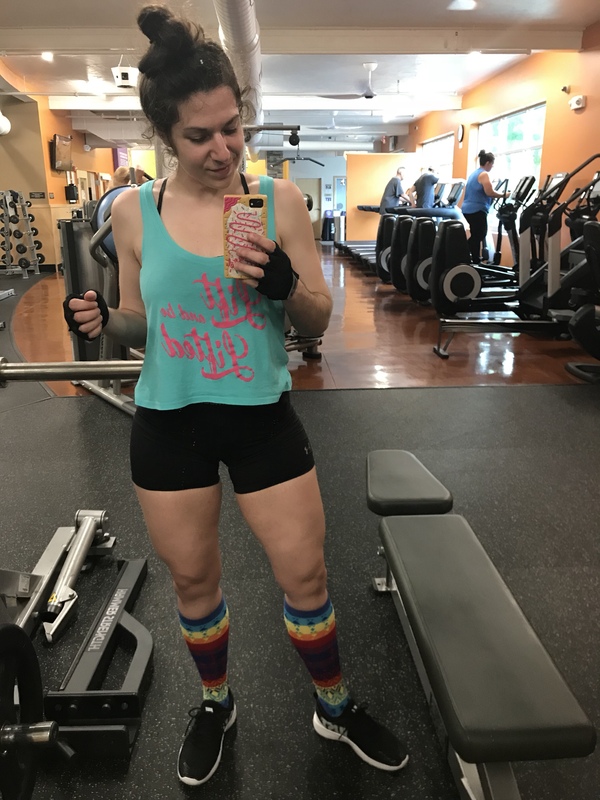 There have been a few days where things feel heavy and I have a few more pep talks. Getting to the gym feels routine and feels good. I’m glad I restarted the program when I did. I’m glad I recognized that openness and shift in my schedule and pushed myself to adapt to it. That’s one of the most important ideas I push to my clients – we need to be flexible enough to adapt and shift how we appropriate our goals. I know in the very beginning of my journey I didn’t think that way. I know some people don’t think that way years into their journey. I certainly know competitors who don’t think that way. But if you want this to be a lifestyle, if you want to engage with your environment in a healthy way – you need to be able to adapt. If you can’t adapt or try to adapt, you will find every excuse to encourage your failure and lack of progress. I feel I’m almost where I want to be. 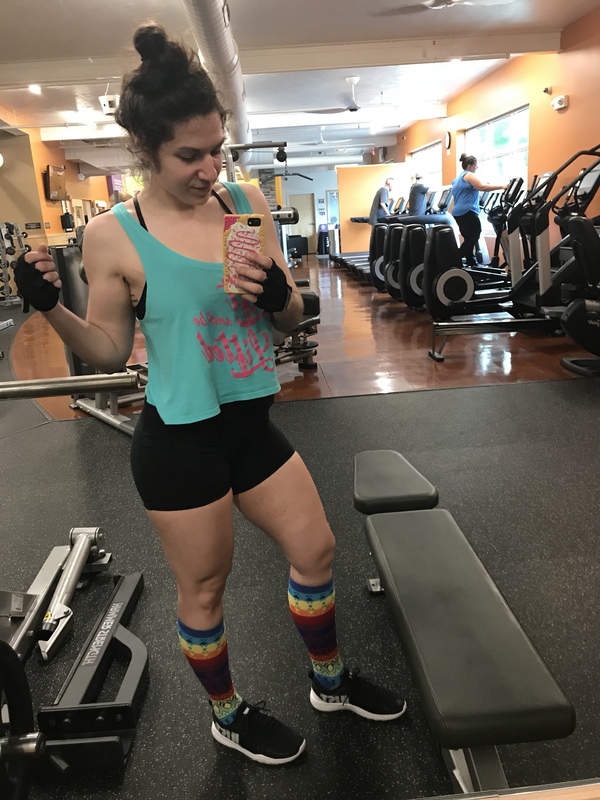 Strength is building and I’m seeing lower body progress like I was hoping. I feel leaner and tighter. Nutrition has stayed the same since I reset my macros a couple of months ago because I increased and changed the style of my activity. It’s really is an art to figure out the balance. Five weeks of consistent workouts, mostly consistent eating. Better sleeping routine. Lower level of stress. Attempting to say yes a bit more often, but we’ll get into the soon, just not quite yet. This is my path for success. Well, it’s post-workout. Post-weekend-pancakes. Post-homework. Soon, we’ll be getting ready for JP’s grandfather’s 90th birthday party. It’s kind of crazy to think about what 90 years of life would be like. His mom has put together a book of stories and memories – she let me contribute too. Even though these kind of gatherings give me anxiety, I know it’ll be fun to hear the stories, sing Happy Birthday and lay poolside for the afternoon. While our bodies don’t run on the same clock and most think of Monday as a new week – Sunday is a new week for me and day two of the sixth week of my program. I’m ready for the new week. I’m ready for June.